﻿ East Fork State Park Campground - Ohio. Find It Here. Located in southwest Ohio, the 4,870-acre East Fork State Park is one of the largest state parks in Ohio. The park offers diverse recreational and natural history opportunities only 25 miles from Cincinnati. Rolling hills, winding rivers and a large lake provides a beautiful backdrop for for a wonderful getaway. 376 sites with electric; 23 full-hookup sites. 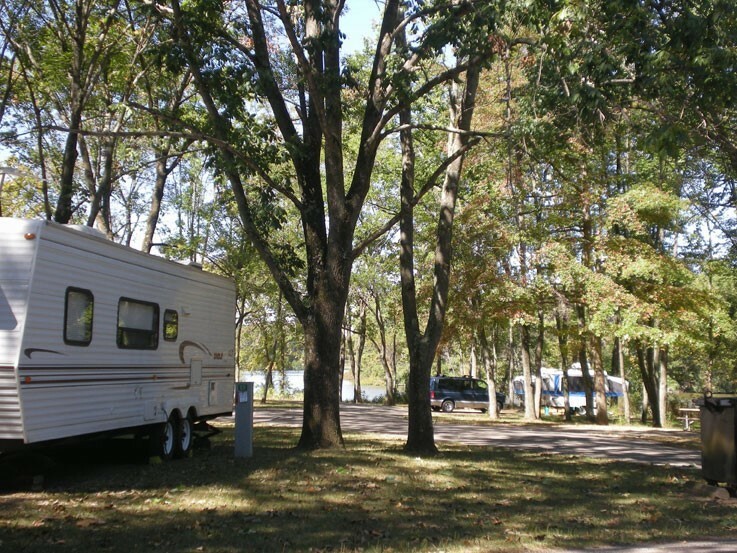 Amenities include showers, flush toilets, drinking water, and boat ramp in the campground. Pets are permitted in all areas. 17 electric sites in Loop A are horse friendly. A 1,200-foot swimming beach features changing booths, showers, restrooms (including mens, womens and family) and a vending area. Unlimited boating on Harsha Lake, and excellent fishing. 46 miles of backcountry trail as well as the 16-mile Backpack Trail and 32-mile Perimeter Trail. Parking and the trailhead are located at the south access parking lot near the park entrance. Access and parking on the north side of the Perimeter Trail are available at the campground visitor parking lot. Showers, flush toilets, boat ramp. Electric or Full hookup. Pets allowed.